The Operation 513 Team evangelized Basildon today and we were blessed with fabulous weather. The team consisted of Rob, Chuck and Myself and a young man named Sasha who lived nearby and had contacted me through the website. We set up and prayed. This was Rob's first time in Basildon and it was his first outreach since coming back from Canada, therefore it was his job to start !! Rob began to preach using his new amplifier which is very loud and clear; he was soon approached by a man who said "the ten commandments were great advice for life". However, as Rob unpacked the commandments the Holiness of the Law began to expose the mans sin to which he began to get angry and walk away. As Rob continued more people gathered to listen and/or heckle. A young couple came up and began to ask "why we were forcing our beliefs on people" etc. Rob dealt with the arguments very succinctly and soon the girl confessed to being a pagan. The conversation was cut short by a lesbian yelling that we were "judgmental", to which Rob turned the accusation against her and asked her not to judge us either. Another lady asked about Bible translations and was thankful for the answers she received. A girl named Sarah who grew up in a Christian home also had a number of good questions and the Gospel was preached to her. Also a grandmother and her daughter and grandchildren came up and asked "the problem of evil question" relating it to specific events in their life. Rob responded with empathy and decorum to which the grandmother kind of appreciated his response but her daughter was not interested. We eventually encountered a "christian" lady who said we were not preaching the Gospel but preaching condemnation. She was very frustrating and tried to stand infront of Rob and tell everyone that "God loves everybody and has wonderful plan for thier life". It made me question if she had ever read Ps 5:5, 11:5, Mal 1:3, Rom 9:13 etc or the large number of passages that explain about Gods hatred and anger towards human wickedness and sin. Anyways, Rob countered these foolish objections by reading John 3.16-20 which makes clear that God's love is for those who repent and those who do not repent are already condemed. During the course of the afternoon many hecklers came and went but the content of the message had obviously offended the lesbian, because she called the police. Soon enough the police arrived and questioned the crowd of angry bystanders who were telling all sorts of lies about us. 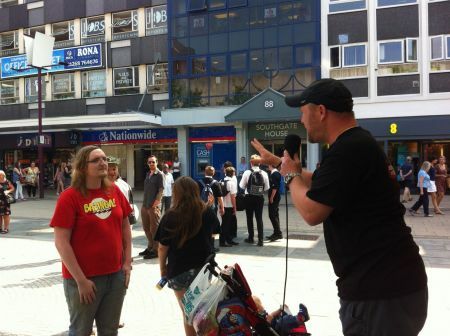 The police did not ask Rob to stop preaching but waited till he had finished before questioning him. Eventually the police arrested Rob for breaching Section 5 of the Public Order Act claiming that he had used language that "caused harassment, alarm or distress". Rob was taken to the Basildon Police Station and I called the Christian Legal Center for help. Later that evening the CLC lawyer arrived and had an interview with Rob and the Police and all trumped up charges were dropped with no further action to be taken !! Rob was vindicated but felt vilified. It does remind me of when Jesus tells His disciples "Blessed are you when others revile you and persecute you and utter all kinds of evil against you falsely on my account. Rejoice and be glad, for your reward is great in heaven, for so they persecuted the prophets who were before you" Matt 5:11-12. By Gods grace we live to preach another day, Praise be to God!! SDG. 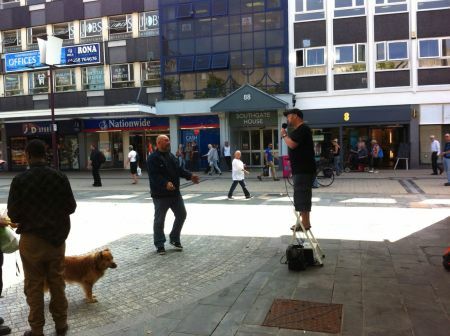 Meets regularly on Saturdays on the Romford Highstreet (in front of Marks and Spencer's). Contact Chuck Bosio for more information.